Burn off that fat! Its not flower arranging. From weekends to weeks, there's enough riding to keep you coming back for more, year after year. Specialized FSR, full suspension MTB hire. Hour, half day, full day and weekly rates. Individually tailored to Your ability. 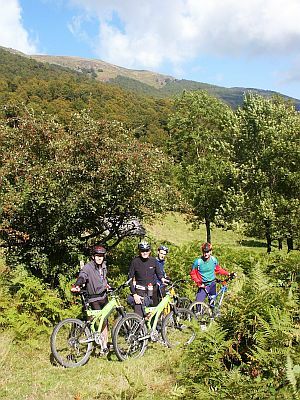 The lush wooded valleys of the Central & Western Pyrenees are ideal for mountain biking holidays at all levels. 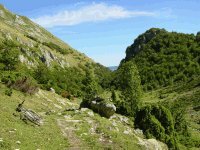 The Eastern Pyrenees offers little shade by comparison with relentless heat and hard gravel tracks. Whether you prefer to kick up some dust, climb through the shade, or tackle daemon descents, VeloLoco will help you find your ideal vacation. 93km of local tracks to explore. Drop off and pick up service. Includes transport to and from the airport, FSR bike and helmet hire, 2 nights accommodation and breakfasts but not evening meals. All mountain bike tours are tailored to ability. Left: Spanish approach to the Port de Salau. Right: Descent from Port de Saleix. Luggage forwarding on point to point mountain bike tours. All grades of technical difficulty and terrain. End your trip at the Mediterrannean Sea! Includes transport to and from the airport, FSR bike and helmet hire. All mountain biking holidays are tailored to ability.